In past few years the demand of Online MBA Programs in India has been increased significantly. Many top universities in India has took a shift from traditional correspondence MBA to online MBA degree programs. India is not behind following the trend, almost all the popular universities & private institutions in India including IMT, IGNOU, XLRI, IIM, Symbiosis, KSOU, Welingkar etc are providing online MBA programs. Here is the list of Universities & Private institutions in India offering such Online MBA programs & reasons why you should join one. XLRI School Of Business & Human Resources : To help working professionals professionals learn new skills, improve their efficiency, learn to compete and think out of the box XLRI Jamshedpur runs 5 post graduate certificate programs in Business Management, Human Resource Management, Logistics & Supply Chain Management, Retail Management, Sales & Marketing Management, in association with two technology partners known as Hughes Communication India Ltd; and Reliance World. The on-line sessions will be delivered on different study centers of our technology partners. Indian Institute Of Management : Various IIM's including Calcutta, Bangalore, Kozhikode, indore, Lucknow runs short term online programs through technology partner known as Hughes Communication India Ltd & NIIT Imperia. These programs are specially designed keeping the latest business challenges in mind. Generally 5-10 years of working experience is required to join most of these programs. Welingkar Institute of Management : The leading management institute of India, Welingkar Institute of Management, offers a two years PG Diploma program through online learning mode. The Institute conducts live lecture sessions from its campus studio for selected subjects from the first year program. In addition to printed study materials & VCF, students get "E-Learning Toolkit" support through website. The e-learning toolkit contains Summary, PPT as well as skill builder modules for every chapter of each subject. This facility is available free of cost to the students. The students are advised to make optimum use of the same. 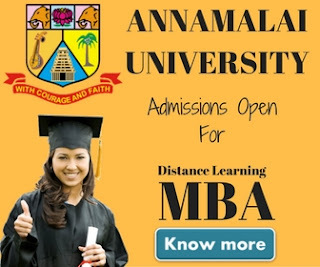 Amity School Of Distance Learning : One of the fastest growing University in India known as Amity University, Noida, Offers a 2 years distance learning MBA program through 3 different learning mode i.e correspondence distance education & online learning mode. Students can join optional personal contact programs. The PCP Classes are backup support of study materials and are offered in 8 to 9 “Sundays” in Six Months. Indra Gandhi National Open University : IGNOU Offers 2 years Online MBA program in IT management. The programme is in collaboration with Eye Square. The total course fee for this program is Rs.75000. If you're a graduate you're eligible for the program. Karnataka State Open University : Karnataka State Open University is the 8th Open University to be established in India, offers online MBA program in collaboration with university 18. The program will equip you with the skills needed to be an effective manager, leader and strategist,the skills you need to enhance business competitiveness and interact effectively with executive management as a strategic business partner. Institute Of Management & Technology : IMT Ghaziabad offers two years Online PGDM program through online mode. the classes would be delivered as live video conferencing via Webex mode. These classes would be conducted on the weekends and are accessible via the internet from anywhere in the world.The exams would be online and of multiple choice pattern. Symbiosis Center Of Distance Learning : SCDL offers post graduate diploma programs in various disciplines The institute offers online MBA programs through it's i-learn 360 degree module. Students gets facilities of Virtual classrooms, E-Mentoring, Prerecorded Lecture and DVDs, Self study material & E-Learning CDs. Don Bosco University : Don Bosco University Assam offers specialized online MBA program for working professionals with a partnership with University 18. The university was established in the year of 2008 & it's recognized by distance education council, New Delhi., India. There could be various reasons why online MBA could be the right choice for you but ultimately your decision should be purely based on your future goals & priorities. The best part of doing an online MBA program is that it gives you the convenience to study at the time of your choice. This kind of programs are best suited for people who can't attend regular classes because of any reason like full-time job etc. Generally universities provides online classes & study material and even if you miss the class you can watch a recorded class. Unlike a regular MBA degree which is quite expensive now a days, an online MBA degree don't give much burden on your pocket. Generally in India Universities charges close to Rs.70,000 to Rs.80,000 for online MBA programs. Programs offered by XLRI & IIM's are quite expensive but rest of the universities charge close to what we mentioned above. 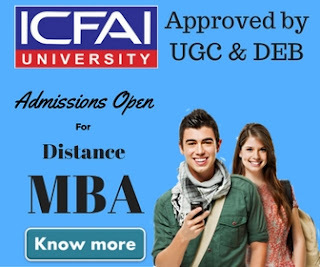 The thing which excite me most about online MBA programs is, you can join any university across the world of your choice without even visit that university & also can interact with their faculty during the online classes which other wise not possible in distance learning MBA programs. As you can join any university across the world gives you a chance to explore more number of specialization which otherwise may not be available in universities in your own country. To become successful in your professional life you must have a strong network of working professionals. An online MBA gives you a chance to interact a wider range of working professionals. It has been seen number of working professionals in the class is higher in online MBA compare to distance learning or correspondence MBA.